She is only trying to survive...to stay out of harm's way...to keep warm...to find some food. To him money is everything. He is trying to earn more...to save more. God brings them together to teach them about his love and how they can mutually bless one another. This is two stories put together. These stories are old classics. The language has been changed updated only in places where it would cause confusion for modern readers. These delightful Christian stories remind me of Charles Dickens' style only the gospel is much more explicit. Think Oliver Twist only with more hope. Jessica is an incredibly likable character. These stories cover the difficulties of her life without sugar coating them but also without unnecessary graphic violence. The short-comings of specific people and the Church at large are a realistic part of the story. The book illustrates how God moves in the lives of the characters to both provide for the problems and deal with the characters' hearts. The stories are interesting and capture your attention. The characters are well-written as one expects from good old literature. The narrator does a good job and captures the mood of the story. She has trouble pronouncing the word &quot;especially,&quot; pronouncing it exspecially, but she is otherwise perfect. This minor flaw does not detract in any way from the story. This is a great book and very family friendly. It would be wonderful for a family listen-aloud or a great bedtime story. I received this book for free from the author, publisher, or narrator on Audio-Book Boom in exchange for an honest review. 🤲 These are books that are part of a collection of stories that are as old as 100 years, being introduced to the audio world. They are wholesome stories that are family-friendly. This is the 2nd book in the series that *I received in exchange for my unbiased review. The 1st one is called SAVED AT SEA, which is wonderful. 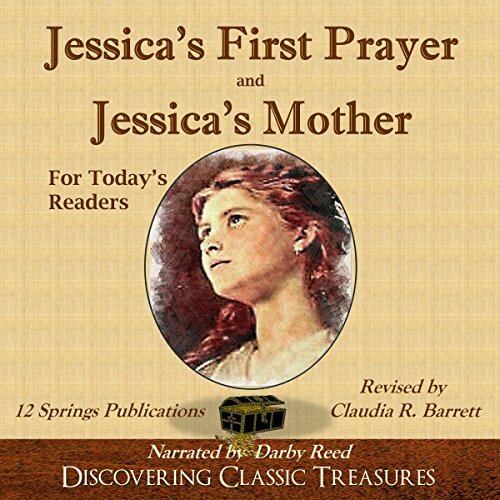 Jessica's 1st Prayer and Jessica's Mother fall into the category that I described above. However, it is very harsh in the reality of the time it was written. I don't think it would be appropriate for children under 10 but is a wonderful look with a good story for all other audiences. Darby Reed is a fine narrator. I did speed up the playback (as I often do) to listen at a more comfortable pace. This book is a little bit rough in the scenery and emotion described. The characters are abrasive but again, I think it is a sign of the time in which it was written. Love stories with a great message. This is easy to listen and will hold your attention. I got this ARC via audiobook boom and this is my voluntary review. I loved the way that the coffee stall keeper fulfilled his duties as not only a seller of coffee but the keeper of the church that he belonged. I like how he tried to keep the two jobs separate but in the end because of Jessica he was able to bring the two together and save Jessica and gave Jessica's mother peace in her final hours of life. The narrator did not meet my expectations but did a good job.These two stories were together one story. At the end of his life, he was able to give Jessica all that she needed to become a good member of society.